When the bankruptcy laws were changed on October 17, 2005, there was an effort to curb abusive filings. To do so, a means test was authored utilizing IRS standards for acceptable expenses. In addition to the means test, there were requirements such as having completed a credit counseling session before a case can be filed and financial management instruction completion before a case can be discharged. There were also measures aimed at curbing repetitive filings. This all centered around the creation of and the existence of the automatic stay. If someone was filing a chapter 13 bankruptcy within one year after a prior case was dismissed, then the automatic stay would only last in the new case for 30 days unless extended by motion. The motion is relatively routine which lays out what circumstances have changed or how is this second filing going to lend a different result than the first filing. The purpose and intent was to allow creditors who were subject to the stay in the first case, who may have not seen the debtor succeed, an opportunity to object to the extension of the automatic stay in the second case. If the stay was not extended, theoretically, the creditor would have a right to proceed against the property and or the debtor personally. What we found out in quick order after the law was revised, was that creditors were not objecting to the extension of the automatic stay in the second case at all. Enter the chapter 13 trustee’s attorneys. For some reason, some chapter 13 trustees who are active in court as well as some of their attorneys, have found the need to object to the extension of the automatic stay even when no creditor objects. Why the judges are even entertaining the trustee’s opinion with regard to the automatic stay is beyond comprehension. The automatic stay applies to creditors of the debtor. The trustee is not a creditor of the debtor. The trustee is a non-partisan, administrator of assets based upon compliance with confirmation issues and other issues under the bankruptcy code. If a motion to extend the automatic stay is set out on notice and no creditor objects, I believe the motion should be granted without any input from the trustee. 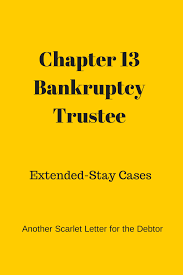 I think it is going to take a few talented bankruptcy judges to turn to the chapter 13 trustee or chapter 13 trustee’s attorney and say “whether or not the stay is extended in this case is irrelevant. Please refrain from advising the court of such as it will not affect my decision on whether or not to grant your motion counsel.” Until that happens, certain chapter 13 trustees and their attorneys will continue to attempt to sway the court with rhetoric that is prejudicial to the debtor and against the trustee’s duties under the bankruptcy code. Should these judges continue to allow this type of conduct and utterances from the chapter 13 trustee and chapter 13 trustee’s attorneys, the fact that a debtor filed a second case and the fact that the stay was extended in that second case will have to be worn by the debtor like a scarlet letter for the rest of the chapter 13 case. In my opinion, that’s an undue burden and an unnecessary characterization of the debtor which I find abhorrent to be proferred by a trustee.